I felt the presence of the retreat perched on top of the hill as I drove up the driveway. After a 3.5 hour drive on winding country roads I was relieved by the tranquillity that I felt as I walked through the front door. The friendly welcome by the reception staff made me feel like I had returned home, and my health retreat experience had begun. How do you settle into a health retreat quickly, and make it feel like your home of wellbeing and healing? The first thing to do is change into leisure wear—comfortable, relaxed clothing. This is easy to achieve! I recommend booking in for a massage on the afternoon of your arrival, so you can relax. Massage can also alleviate detoxification processes. For my retreat visits I usually choose either an aromatherapy or hot stones massage. Allocate 80 minutes if you can. Having a treatment brings both your mind and body to the health retreat experience. It allows you to surrender gracefully! 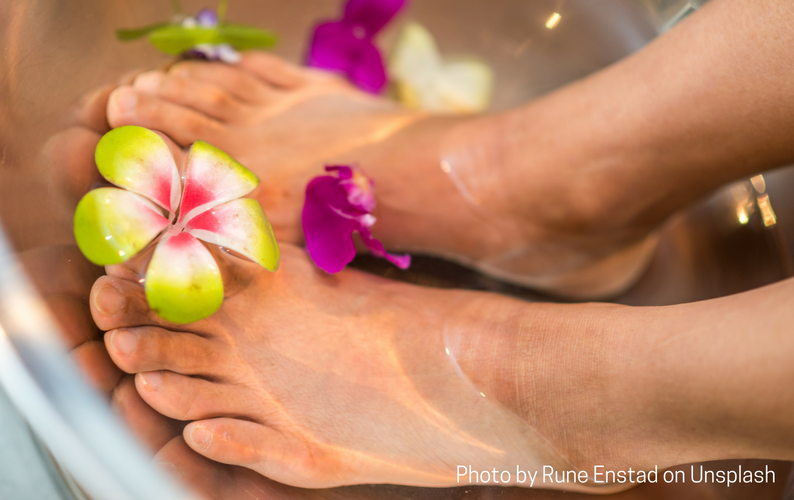 I suggest making bookings before your arrival at the retreat, to ensure that you experience your preferred treatments—massages, body scrubs, facials and pedicures and manicures. The guest experience staff will be able to advise you on the different treatments and help you to select the ones that will best support your health and wellbeing goals. Detox is a word that is used to describe anything from giving up caffeine to decluttering your wardrobe! In preparing for my visit to Elysia, I stopped all caffeine and alcohol 5 days before. I do not drink alcohol regularly (less than weekly) but I do drink chai that contains black tea. I really recommend stopping caffeine (coffee, black and green teas, chocolate, caffeinated drinks and other sources of added caffeine) about a week prior to your visit to a health retreat. I also suggest that you stop prior to your weekend, just in case you experience caffeine withdrawal symptoms. You can read more about caffeine withdrawal here. You might like to try some non-alcoholic beverages before your visit to a health retreat. This is one less adjustment that you will need to make whilst you are in an alcohol-free zone. Take at look at these non-alcoholic drinks. A simple technique to slow down your mind and body is to walk slowly. If you have been busy before arriving at the retreat you will have the tendency to continue rushing. By slowing down your walking pace you reassure yourself that you can relax and slow down. Take a look at the activities on offer. Select the right mix of quiet (tai chi, meditation, yoga, mindfulness) and active (walking, deep water running, cycling classes) sessions for you. Sometimes we need to slow down the mind and speed up the body. This is where a retreat environment can support both. Retreats often offer an education program too, so you have the opportunity to learn about exercise, healthy eating and other health practices such as mindfulness and goal setting. Also make a mindful choice about how much activity time and personal space time you would like. There is no need to participate in every session during the day. Give yourself permission to retreat to your room to relax. Choose the appropriate balance of quiet and active sessions for you. Most retreats have a no mobile phone policy, which means you have to leave your phone in your room. Some retreats don’t even have televisions or internet connection in the rooms. Take the opportunity to manage how much outside world contact you have. Does anyone need to contact you via your mobile phone? You might find that with your combination of daily activities that you will be ready for bed before 9pm. Enjoy the feeling of tiredness and desire for sleep. At sunrise your retreat might offer tai chi or yoga. This is something to aim for. The sunrise at Elysia is exquisite. You get to experience it during tai chi at the top of meditation hill. Is it essential to attend a health retreat to submerge yourself in wellness activities? In an upcoming post I will be sharing tips to create a health retreat experience at home. Keep up to date with Eating for You blog posts and news, sign up for your monthly Nourishment here.